An Egyptian court has sentenced to death 529 supporters of ousted Islamist President Mohamed Morsi. Muslim Brotherhood members were convicted of charges including murdering a policeman and attacks on people and property. The group is among over 1,200 supporters of Mohamed Morsi on trial, including senior Muslim Brotherhood members. Authorities have cracked down harshly on Islamists since Mohamed Morsi was removed by the military in July. Hundreds have been killed and thousands arrested. The verdict now goes to Egypt’s supreme religious authority, the Grand Mufti, for approval or rejection. The final trial session will not be held until April 28, so there is some time left before the sentence is confirmed and there will be time to appeal in that period. The court in Minya, south of Cairo, issued its ruling after only two sessions in which the defendants’ lawyers complained they had no chance to present their case. More than 150 suspects were in court for the trial – the others were convicted in absentia, reports say. Mohamed Morsi was ousted by the military in July 2013 following mass street protests against his government. 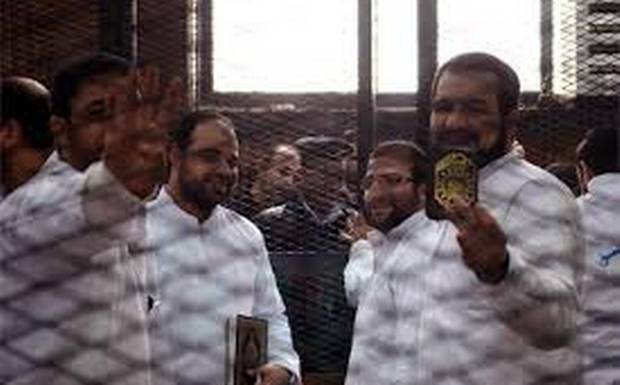 A second group of 700 Mohamed Morsi supporters is due to go on trial on Tuesday.